Buncombe County is located in the mountains of North Carolina. 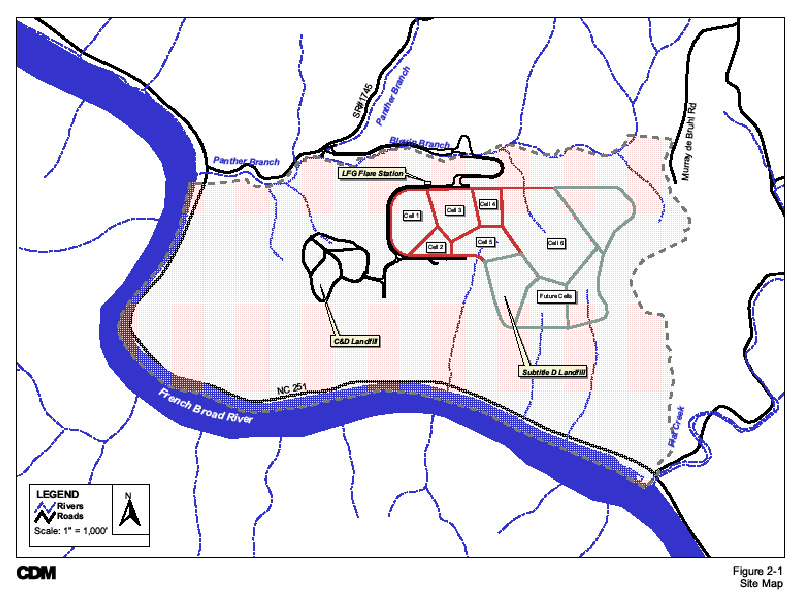 The bioreactor site is approximately nine miles north of the City of Asheville on Panther Branch Road near the French Broad River. 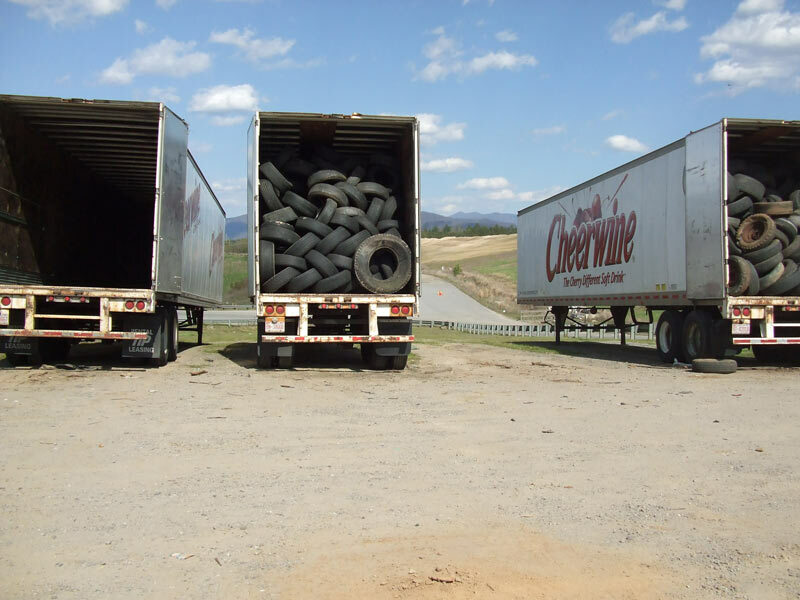 The Buncombe County Solid Waste Management Facility is located in the mountains of western North Carolina, approximately nine miles north of the City of Asheville. 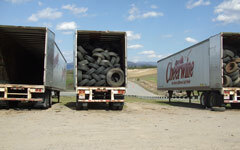 The 557- acre solid waste management facility (refer to Figure 1-1) opened in 1997 and comprises a Subtitle D landfill, construction and demolition (C&D) landfill, wood waste mulching facility, convenience center for residential drop-off, a household hazardous waste (HHW) facility, and a white goods and tires holding facility. 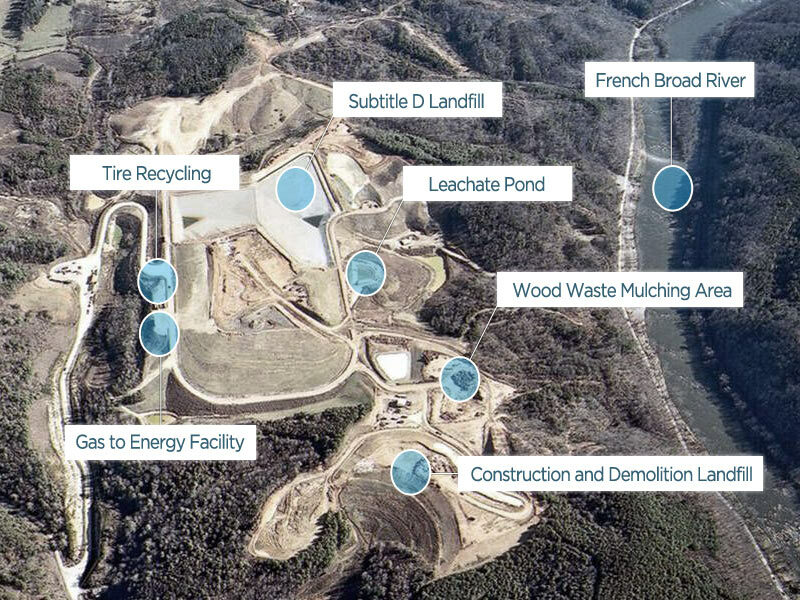 The Subtitle D landfill is 95 acres and consists of 10 disposal cells that are being constructed sequentially over the estimated 30+ year life of the facility. Cells 1 and 2 were constructed with a prescriptive RCRA Subtitle D liner system consisting of a 24? 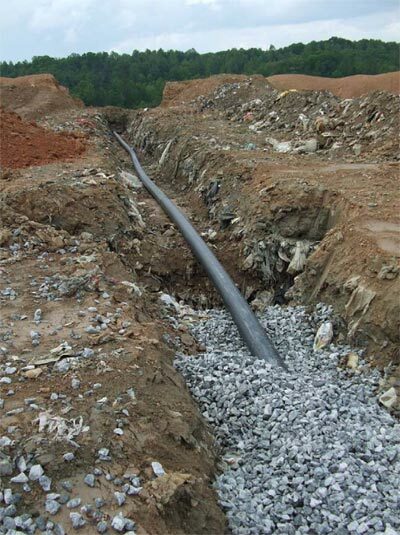 soil barrier layer with a maximum permeability of 1x10-7cm/sec, a 60-mil high density polyethylene (HDPE) liner and a 24-inch rock drainage layer. 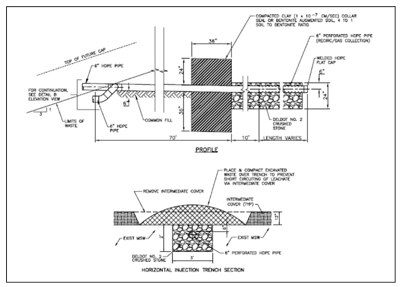 Cells 3-6 were constructed with an alternative liner system that uses an 18-inch soil barrier layer with a maximum permeability of 1x10-5cm/sec, a geosynthetic clay liner (GCL), a 60-mil HDPE liner and a 24? rock drainage layer. Cells 1-5 are filled to capacity and Cell 6 has been the active disposal cell since 2006. 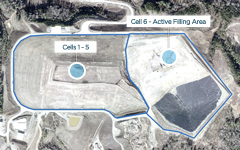 Based on current waste flows Cell 7 is expected to begin operation in 2015. 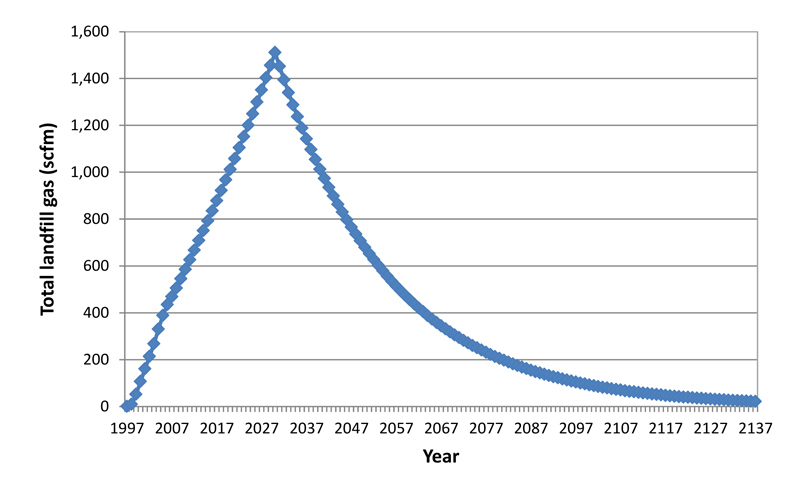 In spite of increasing rates of recycling, landfills remain the primary means of managing solid waste in the US, receiving 54% of the waste generated in 2008 (EPA-530-F-009-021). 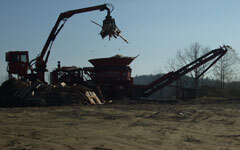 Municipal solid waste (MSW) landfills in the United States are designed in accordance with the technical guidelines provided in Subtitle D of the Resource Conservation and Recovery Act (RCRA) which requires that landfills be equipped with impermeable base liners and caps. 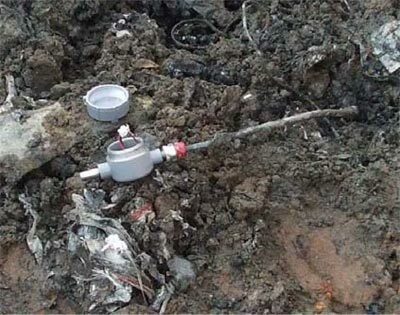 While this requirement has been very successful in preventing groundwater contamination it has also led to the dry entombment of waste at many landfill sites. Some concern has been raised regarding the long term containment of undecomposed waste and the potential for leachate releases after the post-monitoring period ends (typically 30-years) and the liner systems fail. One proposed solution is to operate MSW landfills as bioreactors. A bioreactor landfill uses controlled methods of liquids addition to increase waste moisture content as a means for promoting decomposition of waste. The goal of a bioreactor operation is to achieve a stabilized condition while the landfill is still being monitored. 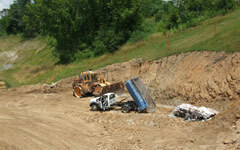 Liquids addition has been applied at numerous landfill sites in the US with favorable results. 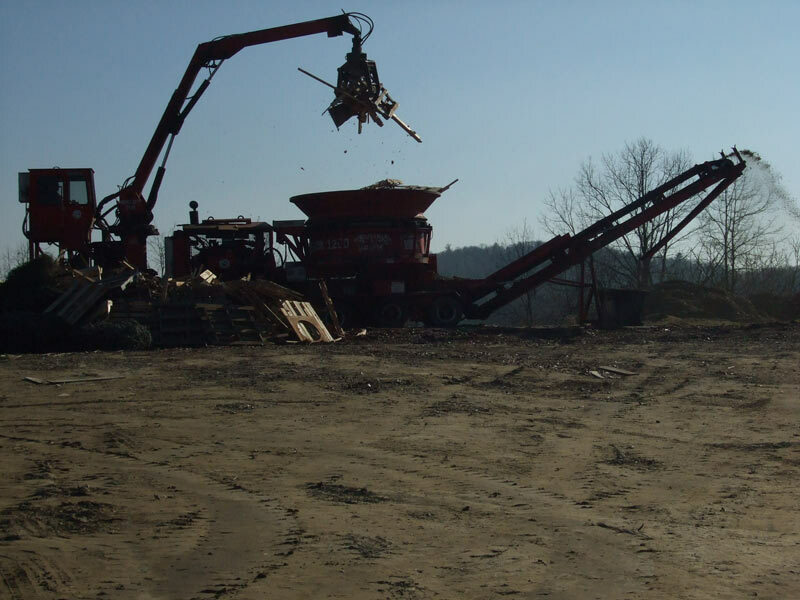 Federal regulations governing solid waste management restrict liquids addition to only those landfills equipped with prescriptive Subtitle D liner systems. 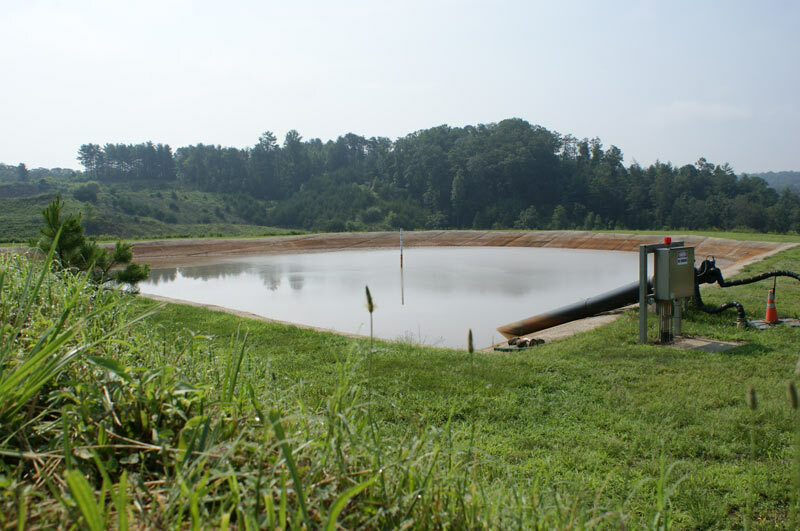 The Buncombe County Bioreactor Project seeks to determine what impact, if any; liquids addition has on alternative liner systems by comparing the performance of the prescriptive Subtitle D liner system in Cells 1 and 2 to the alternative liner systems in Cells 3-10. 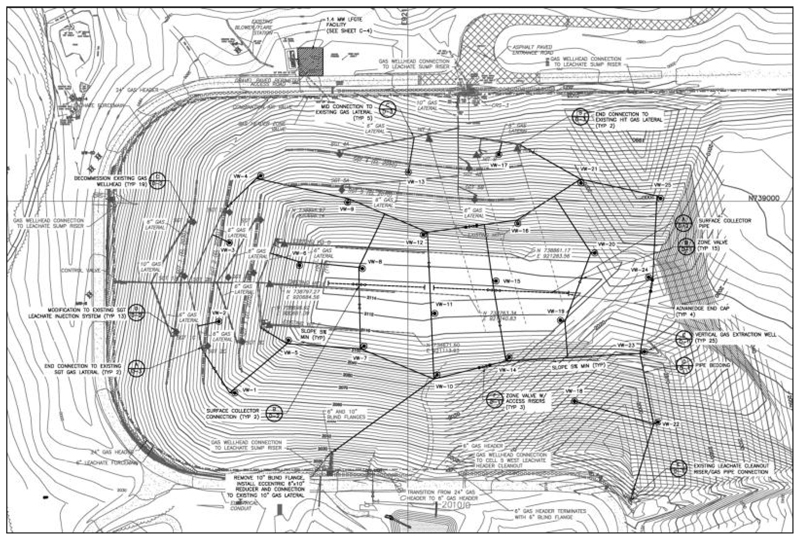 The data obtained from this project may provide support for modifying federal regulations to allow liquids addition in MSW landfills equipped with alternative liner systems. 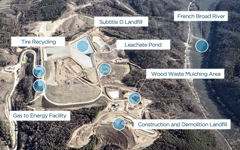 A Final Project Agreement (FPA) was issued by the USEPA under the Project Excellence and Leadership Program (Project XL) approving Buncombe County?s proposal to incorporate a liquids addition process as an integral part of their landfill operation.? This document, which is provided in Appendix A, provides the design, execution, and monitoring framework developed for the project. Public awareness has been an important part of the County?s solid waste program since the siting of the facility in the early 1990?s. 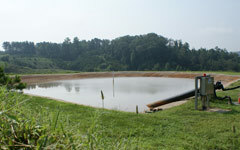 To increase public awareness of the bioreactor project the County staff have given presentations to various groups, led tours for local area colleges and high schools, and performed a live interview at the bioreactor site for Buncombe County Television. Buncombe County convenes periodic meetings of stakeholders to obtain comments on the Project as well as to report on the progress during the duration of the XL Agreement. 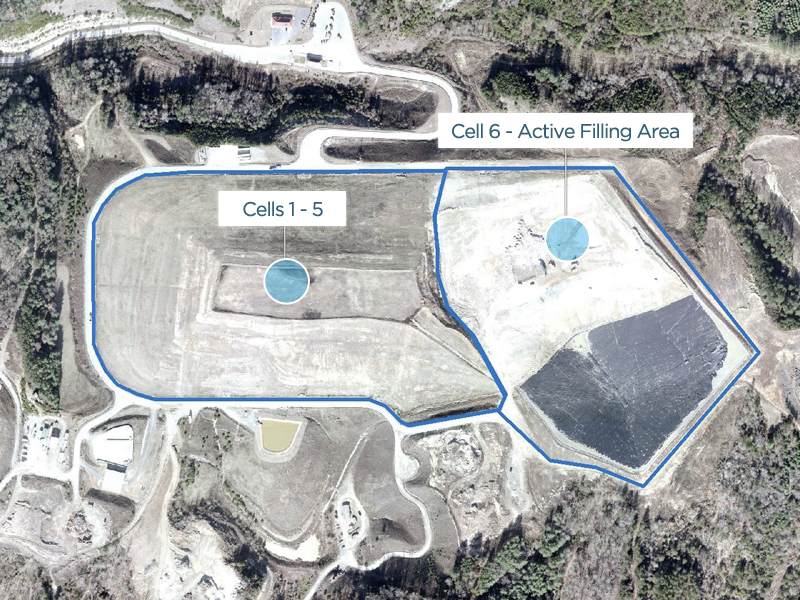 Stakeholders include any individuals, government organizations, neighborhood organizations, academic centers, and companies with an interest in the progress of the Buncombe County Solid Waste Management Facility Bioreactor Project. The first stakeholders meeting was held in August 2008 and the second stakeholders meeting was held on September 20th, 2012. The stakeholder meeting was attended by Western North Carolina Regional Air Quality Agency, EPA by teleconference, NCDENR, University of Florida, Buncombe County management, and CDM Smith engineers. This project was granted regulatory flexibility under Project XL to add liquids to cells with alternative liner systems and to apply liquids other than leachate to the waste mass. To date, only leachate has been used since there has been adequate leachate available onsite to meet the needs of the project. This may change when the build-as-you-go portion of the project is operational since the quantities of liquids addition will increase significantly. Leachate recirculation is not performed during the winter months due to concern of the adverse impacts of cold leachate on decomposition. The project team, in consultation with the project academic advisors, Dr. Morton Barlaz of North Carolina State University, Dr. Timothy Townsend of University of Florida and Dr. Debra Reinhart of University of Central Florida, established a minimum temperature of 50 degrees F for the recirculation operation as measured at the leachate pond. Cells 1-5 had nearly reached capacity when the project began, prompting the need to install a retrofit system. 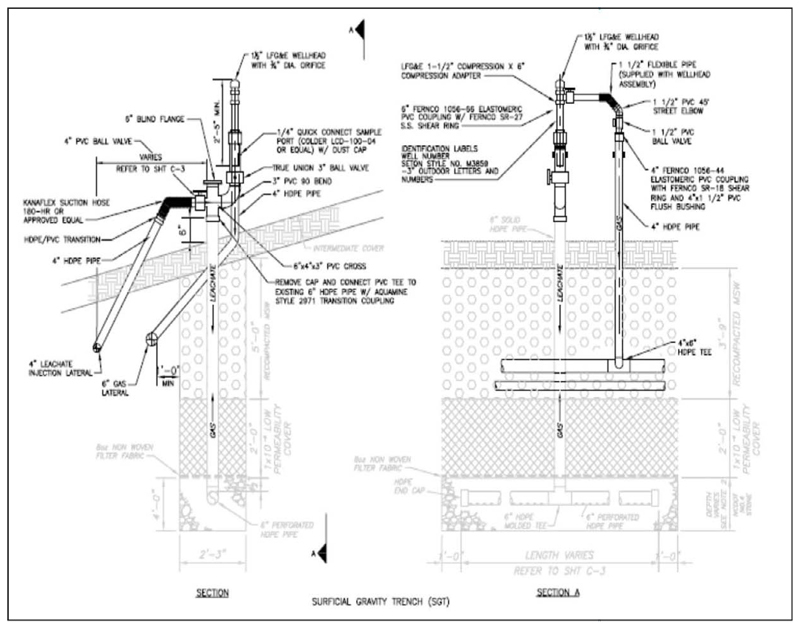 The retrofit system is equipped to recirculate leachate using a combination of horizontal injection trenches (HIT) and surficial gravity trenches (SGT) as shown in Figure 2-1. 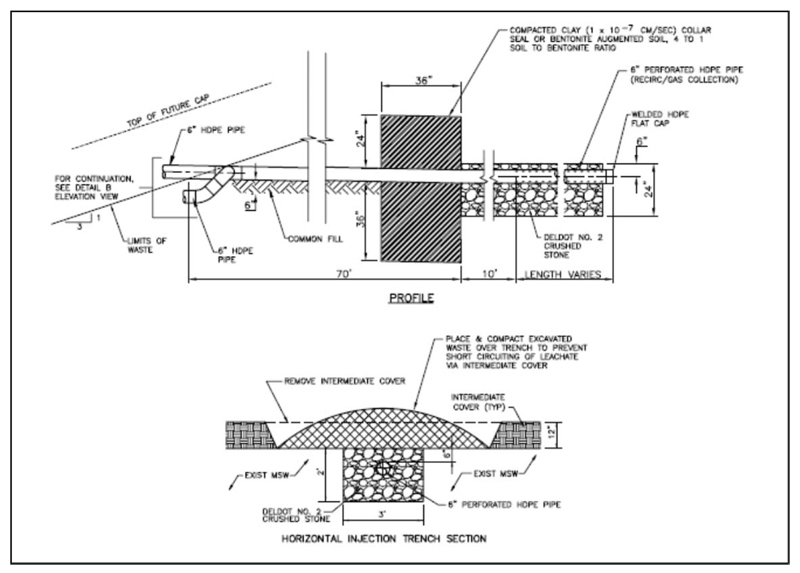 Six horizontal injection trenches (HIT) were installed in the retrofit area. The first three HIT were installed in anticipation of the project being approved when the top of waste was at Elevation 2040. They extend approximately 400-ft south into the waste mass and are spaced 100-ft apart. Three more HIT were installed at Elevation 2080 using the same spacing and extend approximately 800-ft east in the waste. Due to the longer length of these HIT, two pipes were used in each of the trenches to provide more uniform distribution of leachate. This is achieved by using a short pipe that wets the first 400-ft of the trench and a long pipe that wets the latter half of the trench. Construction details of the HIT and SGT are shown in Figures 2-2 and 2-3. 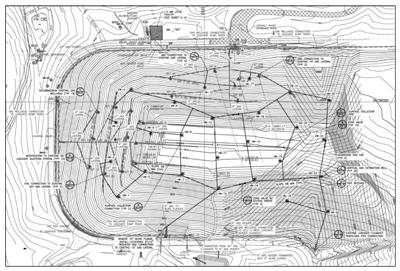 Five surficial gravity trenches (SGT) ranging in length from 450 to 600-ft were installed on the side slopes at Elevations 2030 (SGT 1), 2050 (SGT 2 and 4) and 2070 (SGT 3 and 5). The trenches were excavated 11-ft into the waste and capped with a clayey soil to provide containment of the recirculated leachate and allow gas collection without air intrusion. Due to their shallowness the SGT are operated differently than the HIT. The HIT are allowed to be pressurized up to 10 psi while recirculating leachate to provide greater lateral distribution while the SGT are operated as a gravity- feed system to avoid leachate seeps. All future trenches will be installed during the operational phase of the cells to provide earlier implementation and more thorough wetting. 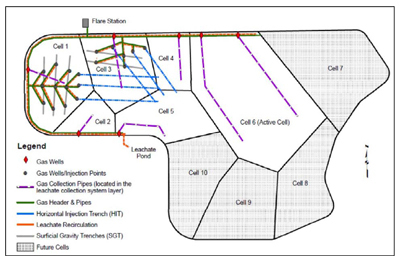 Twenty five (25) vertical gas collection wells were installed in Cells 1-5 as shown in Figure 2-4. At the time of the new well field installation the gas collection component of the HIT and SGT was de- activated. 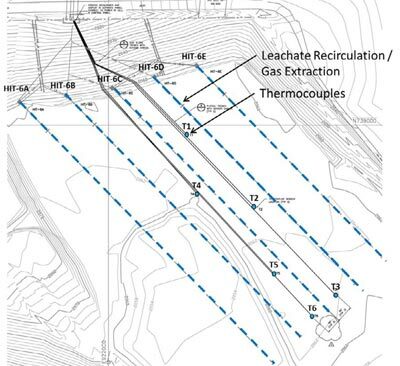 Landfill gas is also collected from the cleanouts of the leachate collection system of each cell. The gas collection system is collecting 350-400 scfm of LFG from Cells 1-5. 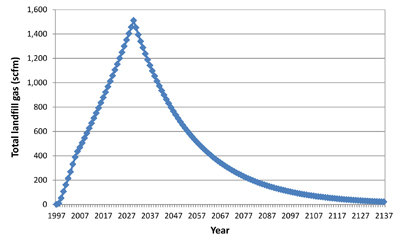 Based on the LandGEM model, the peak flow rate for the site is estimated to be 1,500 scfm in 2030 as shown in Figure 2-5. 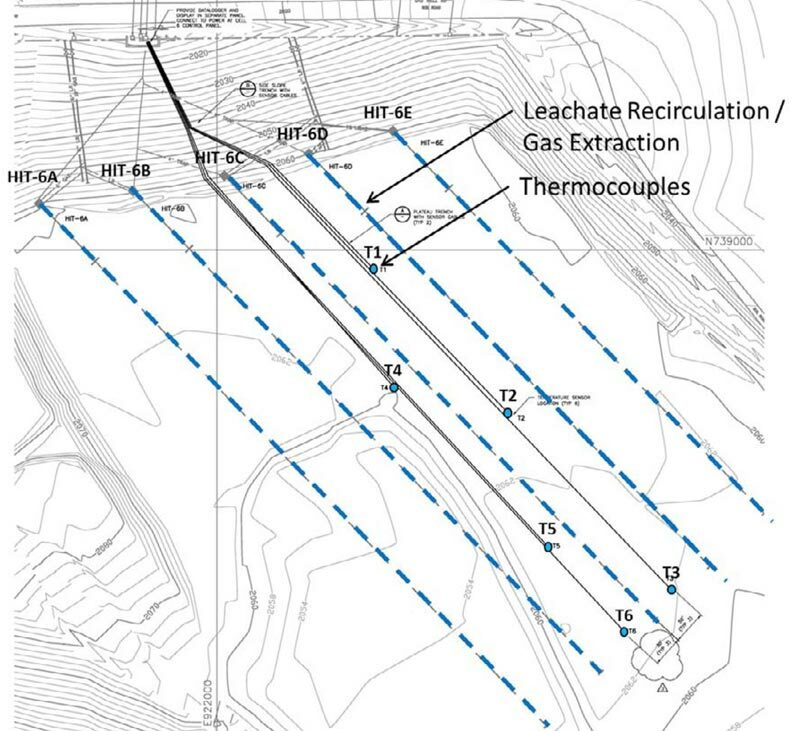 Gas flow to the LFGTE facility will increase over time and will experience an incremental increase once the Cell 6 Phase 1 HIT go online in 2013. A second generator may be added to the LFGTE facility when the flow rate exceeds 900 scfm. Phase 2 is a build-as-you-go bioreactor system which means that the infrastructure is installed in stages as the waste is being placed. The build-as-you-go approach will provide a more extensive wetting of the waste and earlier capture of landfill gas. The first stage of the Phase 2 system was installed in Cell 6 in 2012. The first phase of installation in Cell 6 was completed in July 2012. 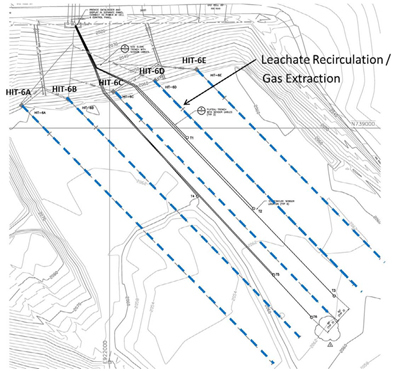 This includes six HITs for both leachate recirculation and gas collection as shown in Figure 2-6 and 2-7. The 100-ft solid section of piping of each HIT is sloped at 3% to drain towards the outer slope of the landfill. 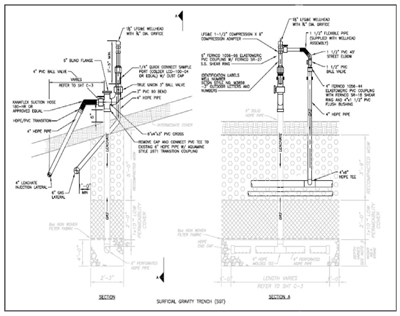 A gravity drain was installed from the head of each HIT down the slope to the leachate sump riser pipe to allow excess recirculated leachate to be removed from the HIT after injection events. This is intended to prolong gas collection capability of the system. The liquids addition process typically takes between 2 to 6 hours per event and is continuously supervised by the Bioreactor Manager. 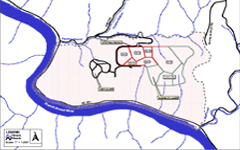 A rotation schedule is used to allow time between injection events for leachate to drain from the trenches. The rotation schedule is adjusted as needed to account for the varying rates of drainage of the HIT and SGT. Leachate recirculation is reduced or suspended during periods of rainfall until the area dries out sufficiently. 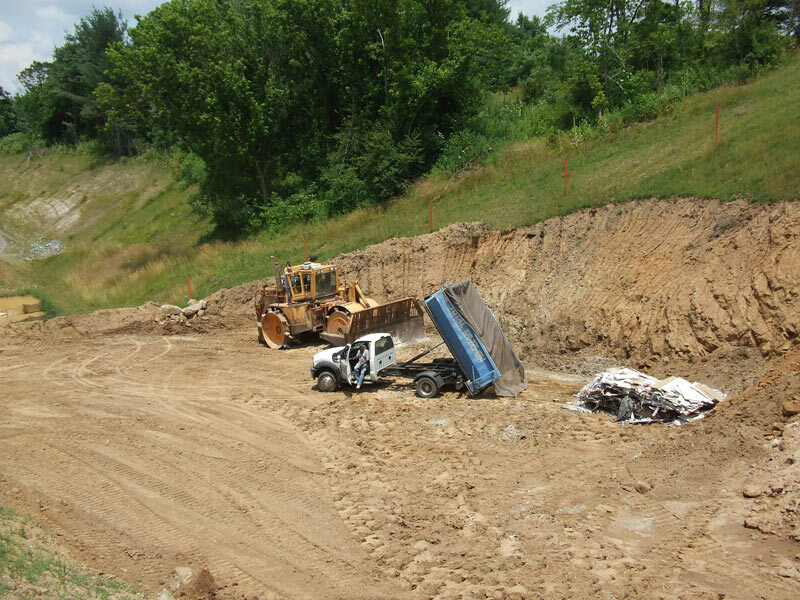 The landfill side slopes are carefully inspected during and after each injection event for leachate seeps. 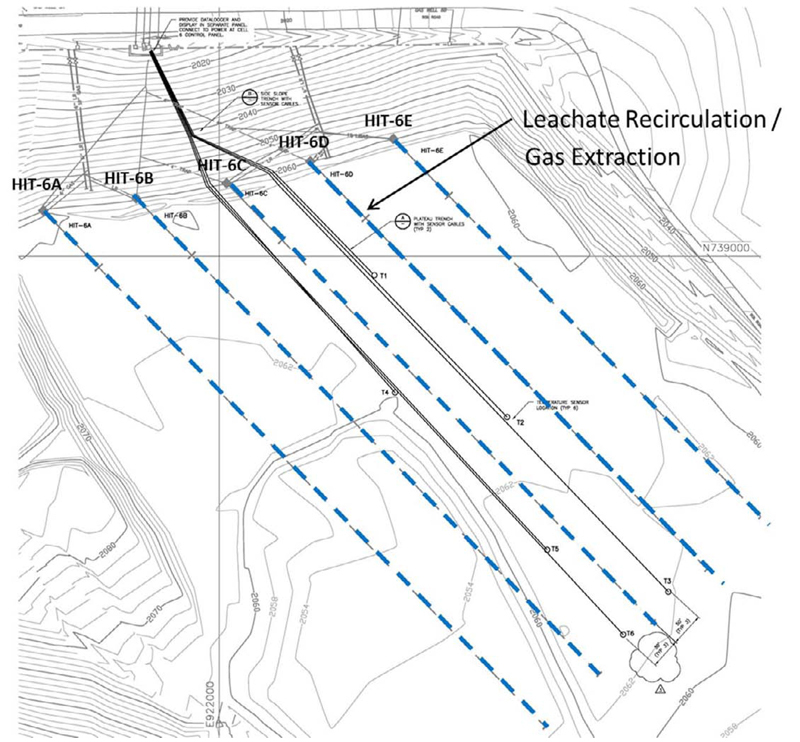 The plan for recirculating leachate and collecting gas is described in Section 6. 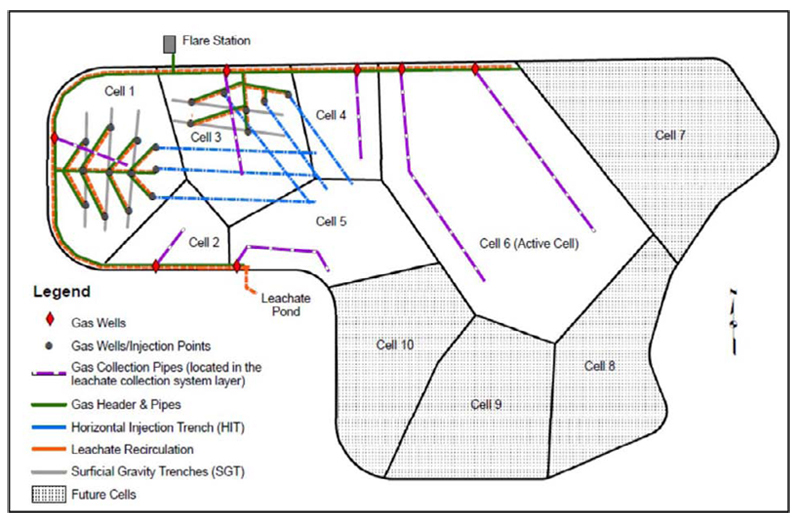 Thermocouples were installed in six (6) locations around the Cell 6 HIT in July 2012 as shown in Figure 2-8. These thermocouples consist of a stainless steel temperature sensor with a lead cable as shown in Figure 2-9. These thermocouples were placed in 4-inch perforated PVC pipe packed with concrete sand. The cable end of the pipe was left open to allow cable movement and leachate to contact the sensor. The sensors transmit temperature data to a datalogger installed near the Cell 6 pump station control panel that will be downloaded periodically. 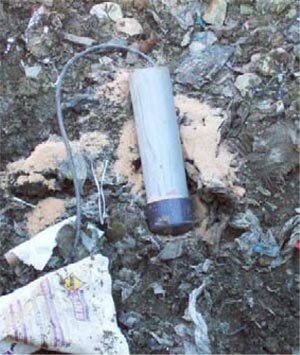 Temperature readings will be used to monitor decomposition as mesophilic bacteria typically range between 80 and 115?F. The sensors will be helpful in assessing the impacts of leachate temperature during injection. As ambient air temperatures drop in the winter the leachate in the pond will get colder. 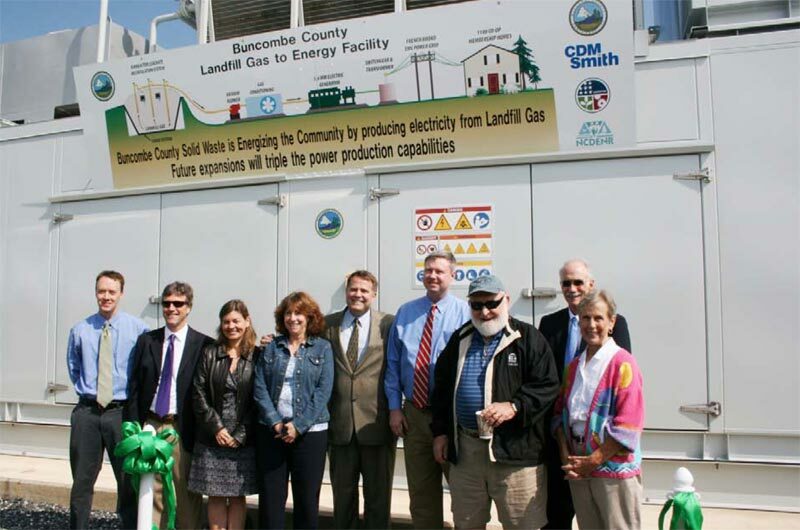 Buncombe County built a landfill gas-to-energy (LFGTE) facility at its bioreactor landfill to take advantage of the accelerated gas generation. A request for proposals (RFP) was advertised to evaluate private sector interest. At the same time, CDM Smith developed project cost and revenue estimates under a scenario where the County would self-finance the project. Comparison of nine energy developer proposals to the self-financing option showed that the net revenue would be substantially more if the County self-financed the project. The County elected to proceed without a developer. CDM Smith designed and permitted the LFGTE facility which includes a 1.4-MW generator set, gas conditioning system, and a well field consisting of 25 vertical wells. 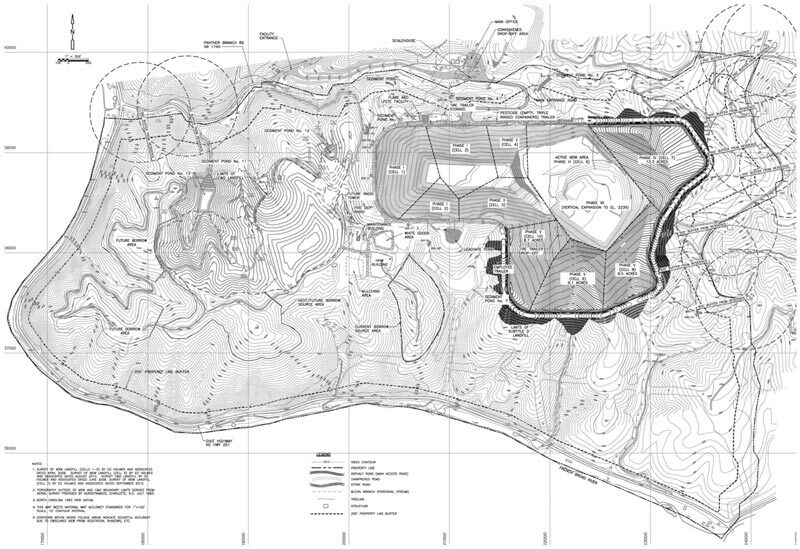 CDM Smith completed design and permitting of the facility under a fast track approach to reach ?shovel- ready? status for ARRA funding. After successfully demonstrating the project?s merits, the County was awarded a $3 million grant. 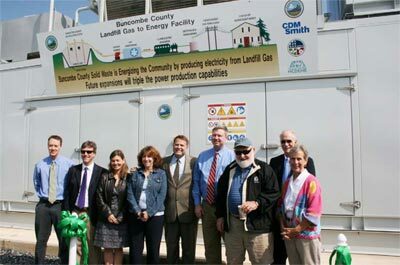 The County completed construction of the LFGTE facility in November 2011. The inaugural ribbon cutting ceremony in May 2012 is shown in Figure 2-10.